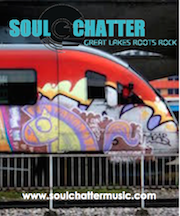 Soul Chatter is roots rock, indie, folk-influenced, white soul, retro; ultimately the listener will decide what label(s) apply. We take the lyrics pretty damned seriously (at least the lyricist does) and work to create soul stirring compositions that stay with you, make you want to dig in a little. Intelligent, melodic, listenable rock songs with strong melodies, crisp guitar and rollicking keyboards. Toss in some horns and strings and plenty of heart. Cleveland, back in the stone ages. The early 1980’s. Dark and dusty warehouses, long rehearsals, no money and trying to play only original music in a town with very few venues straying from a cover band format, especially with no local connections and certainly no pedigree. Modern music was hitting the radio. MTV had stumbled across its video format. We had real drums, a battered Wurlitzer electric piano, a couple of battle scarred amps and no ability or desire to play synth bass or a drum machine. Oh yeah, we also have a handful of classic (and true, I swear) stories about A&R calls from Geffen, Inner City Records, etc. that came ever-so-close to a real recording deal. You know; the kind of anecdotal stuff that makes for decent after work stories with your work pals and a couple of cold ones. After years of working ‘real jobs’, raising families, mortgages, etc. we could never quite shake the fact that we really missed this music thing. So our ragtag band of veteran musicians pull the covers off the studio gear, write and rehearse like we never too a break, and get back to work on a fresh new batch of songs. We hope like hell that you enjoy listening as much as we enjoyed writing and recording them. Brian Stepien—The writer, the vocalist and lyricist. The wannabe poet. The self taught songwriter with no clue what the rules and mathematics of written music are all about. Never learned them. I just always wanted or needed to sing out all of the crap that fills this head: the isolation, the observations, the home grown off-kilter dime store philosophy, the humor and hope. Dale and I started writing together and eventually he just wanted to play the piano. Can’t fault that logic. I was soon on my own for coming up with new material. So here it is! Dale Schmitt—Our keyboard player. Piano, Wurlitzer, organ, horns, strings, bass, plus whatever effects we can dream up. Dale was our version of a child prodigy. Organ lessons from the toddler stage. Piano as a teenager. Surrounded by crate after crate of pop records from the sixties and seventies. All of those sounds and melodies crowding his head. I think he could learn to play any song he wanted to in a matter of minutes. I was completely and utterly jealous of his ear, his fluidity, and his musical recall. When you are stuck on who performed a particular song from long ago, Dale could always recite every detail. Jim Monica—Our guitarist. Lead and rhythm. In the early days and once again at the time of this writing. He has, over the years, perfected the art of defying the numerous doctors who at various life stages have told him we would never play guitar again. He has proven a veritable Houdini, escaping injury, surgery, the occasional stray sharp object or full sized vehicle. Always bouncing back to solo another day. He is the only one of us that never stopped performing live, in various projects in Cleveland. His depth of style and substance continually grow. Just like his vinyl and guitar collections. Mike Docy—The engineer. He has pretty much always been. Certainly not exclusively, he has recorded countless bands and sessions over the years. He is a scientist, an engineer, a multi-instrument musician. He hears things the rest of us cannot hear. We are forever grateful for this amazing ability. He is blunt when he needs to be; he will tell you if something we just recorded stinks. This is yet another very useful skill. His long hours of listening and tinkering have been a godsend. When he is working with us on a recording we simply stand back and watch while he guides us through another session. George Hart—George was gracious enough to sit in on drums for our latest set of recordings. He worked tirelessly to come up with a solid, tight, fitting arrangement for each of the songs he was tasked with. We are humbled and grateful.